Many may see Wonderful World as just another quirky, indie comedy about growing up. While you wouldn't be wrong in that assumption, writer/director Joshua Goldin instills just enough freshness to create a lasting impression. It doesn't hurt that this is Matthew Broderick's best role in years or that it captures his depth as an actor. Still, the melancholy acoustic soundtrack and the eternal pessimism of Broderick's character can't help but recall other films of similar substance with better outcomes. Matthew Broderick is Ben Singer, a failed children's folk singer and nearing a decade in soulless proofreading for a large company. His failure as an artist has instilled in him an angry view of the world. Divorced and sharing a one-bedroom apartment with his friend Ibu (Michael K. Williams), Ben spends most of his time doling out truths about the conspiracy theories and the negative nature of reality — that is when he's not smoking pot. Ibu, an optimistic immigrant from Senegal, constantly challenges his views as he routinely beats Ben in chess. Yet, despite Ibu's best attempts, Ben sleepwalks day-to-day, even when spending the weekends with his slightly estranged daughter, Sandra (Jodelle Ferland). Ben's world is suddenly shattered even further when Ibu falls into a diabetic coma and his sister Khadi (Sanaa Lathan) comes to visit. Despite Broderick's success, one can't help but feel he's putting part of himself into the role. It feels a bit like Broderick’s version of The Wrestler, and while his career has never fallen as flat as Rourke’s, it hasn’t been booming much this decade. Whether or not he's reaching into a part of himself for the character, he plays the stone-faced Ben commendably. Goldin's reliance on Ben as a pothead is a bit cliché but, to his benefit, he doesn't rely too much on Ben's substance abuse. The introduction of Khadi has hints of The Visitor, in which a bored, depressed man is drawn into the drama of foreigners and their different views on life. Unlike Ben, Khadi is new to America and still sees it as the land of opportunity. She notices Ben's reluctance to enjoy life and, like her brother, attempts to draw him out of his funk. It's not until his pessimism affects his relationship with his daughter that he really begins questioning himself. 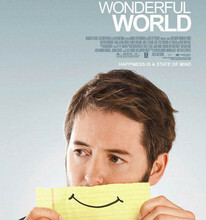 Like many indie-comedies, Wonderful World is about a man scorned by the world and his journey to open himself up again. Ben's dreams have been shattered and he retreats into a cave of self-loathing and cynicism. However, it's those around him who slowly reintroduce him to the beauty of that world he rejected. It's not really a paramount message in film, or in art, but Broderick and Goldin do a fine job of creating something that has enough heart to overcome its shortcomings in originality.